My friend Ruth is a prodigious seminar taker. A few years ago she took one that taught how to solve a problem by first defining the problem. I think that is a seminar most nonprofits should take. To me it has always seemed obvious that you cannot solve a problem if you are unclear about what problem you are trying to solve. Most of my clients would define their problem as a lack of money (or, as nonprofits love to whine, “not enough resources”). But perhaps it would be more accurate to say that is the cause or, more likely, the result of the problem and not the problem itself. Defining the problem often means accepting responsibility for what is going on. If lack of money is the problem, well, that’s not necessarily anyone’s fault. If, on the other hand, the real problem is how the money is allocated and spent, that’s a whole different kettle of fish. For many organizations, the problem seems to be circular: we don’t have enough money or resources so we cannot invest in a program to develop money and resources, which means we don’t ever have the money and resources. This in turn generally leads to a paralysis that ensures that there will be no money and/or resources and that means that your mission doesn’t really move forward. From where I sit, it feels like I am watching a comedy of errors. Once, a client paid me good money to write a direct mail piece. Several weeks after they approved the package, the Executive Director sighed that they just didn’t have time to get it done. I said I would get the printing and mailing quotes, and then once a vendor was chosen, I would follow the mailing through. First, however, I needed to know how many pieces they would be mailing. Well no one, it seemed, had time to check out how many records there were on the database and numbers like 2,000, 5,000 or maybe around 8,000 flew. Not helpful. I couldn’t go into the database to check because it was held on one computer and I guess that computer was in use 100% of the time every day of the week. Must have been. I took my best shot, got a quote, and eventually got an okay to move forward. Except—yep, no one had time to export a list. And so, the mailing never happened. An extreme case? I’d like to think so, but I’m not entirely convinced. Whether or not your organization resembles this, being clear on the problem will make a positive difference. If your organization writes grant proposals, you already know how important the problem or need statement is. The clearer and more precise you can be about why what you want to do is necessary and important, the better your chances are of actually getting funded. More importantly to my way of thinking, a clear need or problem statement helps to ensure that you are going after a grant that will move your mission forward. Likewise, identifying the right problem ensures that you look for the right solutions. This is turn will help to make sure you are getting where you actually want to go. Janet Levine is a consultant who focuses on increasing productivity for nonprofit organizations, their staff and volunteers. She can be reached at janet@janetlevineconsulting.com. Gets Grants!, an online grantwriting class is is available at www.janetlevineconsulting.com/classes.html. This entry was posted in Grantwriting, nonprofit management, problem solving. Bookmark the permalink. 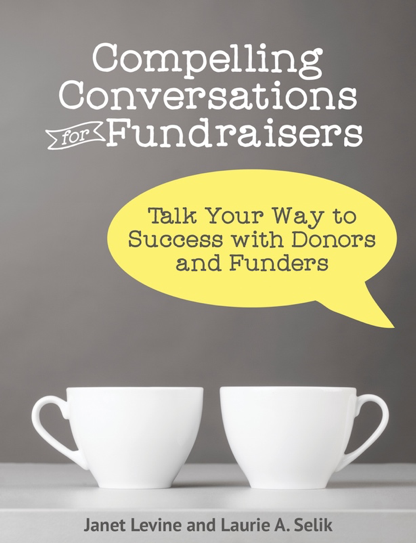 Want another fundraising tip? Check out http://www.cafegive.com, where a portion of every purchase goes to support a non-profit of your choice. How sweet is that? Get what you need and make a difference in the world. We'd love a shout out on your blog if possible. Let me know if you have any questions or comments!